After the Jonestown massacre of 1978 there was intense pressure on the US government to investigate those cults seen as dangerous to their members and deceptive in their recruitment and indoctrination methods. In 1979 the wife of L. Ron Hubbard the creator of Scientology was jailed along with 11 other Scientologists for conspiracy. In 1981 Reverend Moon, the head of the "Moonies" cult was convicted of tax evasion and was gaoled in 1984 after lengthy legal appeals. It was in this period that Guru Maharaj Ji as Prem Rawat then called himself, the Perfect Master of the Divine Light Mission, directed his followers to destroy all copies of the books, magazines and other media the organisation had published in the preceding decade. Shortly thereafter he closed the "ashrams" containing thousands of his devotees who were living celibate, communal lives with all their finances and time completely dedicated to his organisation and he ended the nightly public testimonial meetings ("satsang") that had been the major focus of his followers and attempts at proselytisation and disappeared from the public eye. This is surely one of the most audacious attempts at re-inventing oneself ever attempted by a minor (albeit the Lord of the Universe in the minds of his followers) cult leader and has parallels with the criminal attempt by L. Ron Hubbard's followers to infiltrate US government departments to destroy documentary evidence of their leader's life and lies. Rawat had cut short his education in India at the age of 13 to kick-start his career in the West as the Perfect Master and Lord of the Universe and to enjoy the life-style available to a cult leader whose followers believed he was a divine incarnation and so he was probably unaware that copies of much of these texts would be stored in public libraries. As his current organisations (the Prem Rawat Foundation and Elan Vital) are now trying to publicly present him as a world renowned and respected "Teacher of Peace" I am presenting these texts for anyone who wishes to gain a more complete picture of his career, unsuccessful and venal though it has been. Satguru Maharaj Ji Early booklet from the USA that appears to have been published in late 1971. Reflections on an Indian Sunrise Early Divine Light Mission pamphlet/magazine from the USA published in early 1972. The Golden Age and The Divine Light News were the official Australian Divine Light Mission magazines and were published from 1973 to 1979. My own copies were burnt in 1982 by my more obedient partner after I had packed them up for storage as essential texts that documented important parts of my life in the 1970's. Fortunately copies had been archived at the Australian National Library and these are still freely available. 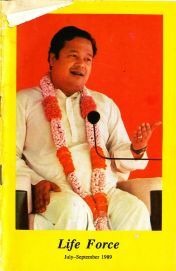 Post 1983 Rawat made a nearly complete change of his public persona, dropped most of the Indian terminology (though he simply changed his title to Maharaji (="Ultimate Ruler") and adopted a less hectoring tone and his speeches began to be edited far more tightly in further publications though visual media now dominated his organisations' productions. Now only brief excerpts of his speeches were likely to be printed often with complex formatting and photos of himself. A step into the new era of Rawatism propaganda. Bright, colourful and more professional. Unfortunately for Rawat this was more expensive and less successful than his 1970's messages. Eleven heavily edited speeches collected and published in 1994 with nature photographs and a few small, carefully Photoshopped images of Rawat. Miscellaneous Proclamations proclaiming His ability to save the world if only everyone will recognise His glory and bow down before Him and Letters to his premies attempting to boost their spirits, instruct them and give agya. Miscellaneous Pamphlets usually created for "propagation" ie attempting to gain new converts. As they usually contained photos of Prem Rawat (then known as Guru Maharaj Ji) and excerpts of his speeches, they were unsuccesful. Many thanks to the people who made these texts available on the internet for their dedication to truth.